I've used Windows for many years, using Dreamweaver as my editor as it had a file tree which is based on a project (via Local, FTP or SFTP). Additionally, I wouldn't mind features like debugging, class listings, etc, as long as I can hide them away. Even when I added the accepted answer at the question mentioned by @fossfreedom, more precisely at Dreamweaver alternative in ubuntu?, in the comments of your question. I must accept that I didn't notice before the existence of Aptana Studio. I include here a few screenshots for you, covering some of the points of your interest. illustrated in the above screenshots. I have noticed that there is support for FTP/SFTP file browsing/management but these are features that I don't use so I can't provide further details but I am sure you will find it in the Aptana Studio site. In my experience, I stopped using all these tools that I formerly used in order to start enjoying this excellent application, that tops all the other similar alternatives. I suggest you to try it. Is as easy as download and run, or follow the instructions of the producers in order to have this application installed and running in your system. For me is good to have it inside of my home folder, from where I start it by double clicking the program's icon. The application will find its updates and download to the appropriate folder when necessary. There are several alternatives, like those mentioned in the previous questions, including those that features WYSIWYG editors. But this is also a great alternative. For a DW replacement software, there's probably nothing closer than Quanta, which unfortunately drags in a lot of KDE dependencies on the standard GNOME desktop. While Kompozer/Nvu let you toggle between code view and and WYSIWYG, they both lack some of the features of DW, though there's definitely a good range of features to love about each. My favorite development platform is Bluefish, for its excellent syntax highlighting. 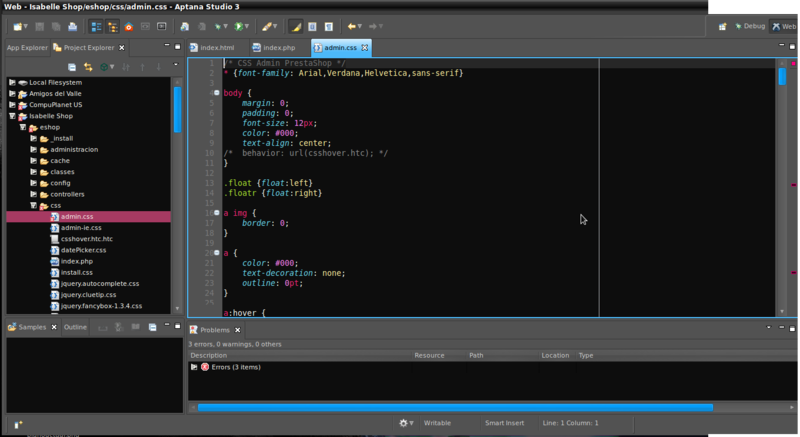 For a more full-featured development environment, there's Aptana, Komodo, and Eclipse. 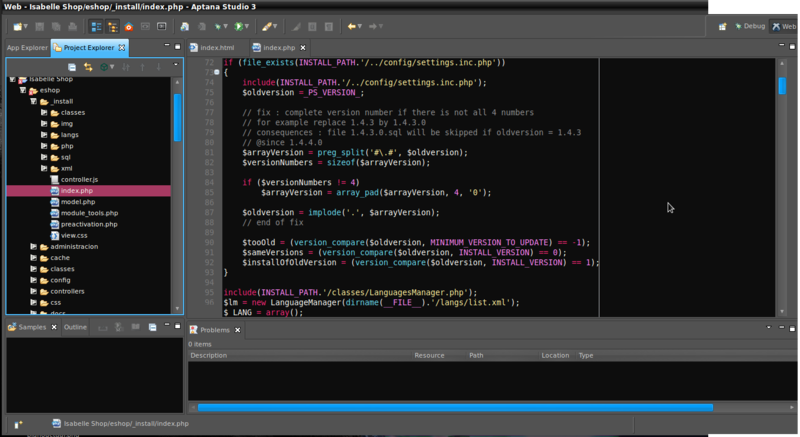 You can use of course Eclipse + plugins but it's really like using a bomb to kill an ant. I would probably have to recommend KompoZer, which is an unofficial bug-fix release of the popular application, Nvu. Finally, a top-notch WYSIWYG web page program for the rest of us! Now there's no need to >pay a little fortune for a program to create and edit great-looking web pages, including >powerful and easy to use CSS capabilities. KompoZer is designed to be extremely easy to use, making it ideal for non-technical >computer users who want to create an attractive professional-looking web site without >needing to know HTML or web coding. KompoZer version 1:0.8~b3.dfsg.1-0.1 is currently available in the maverick and natty universe repositories. Your question seems to be a little bit ambiguous. First of all and related to the alternative to Dreamweaver, I found all the suggestions of all the other answers excellent, but when looking for an alternative to Dreamweaver, the closest application -for me- it was the Amaya Project. Which seems to be richest than other alternatives and a little bit more sophisticated than the Kompozer. You may find it a little bit unstable, or at least it was for me but it may also fit your needs. After playing with WYSIWYG editors, I prefered direct encoding with BlueFish but it is not a WYSIWYG editor. And about the suggestions for your issue with the firebug I can't say anything, sorry. Please let us know how did you do if you give Amaya a chance. 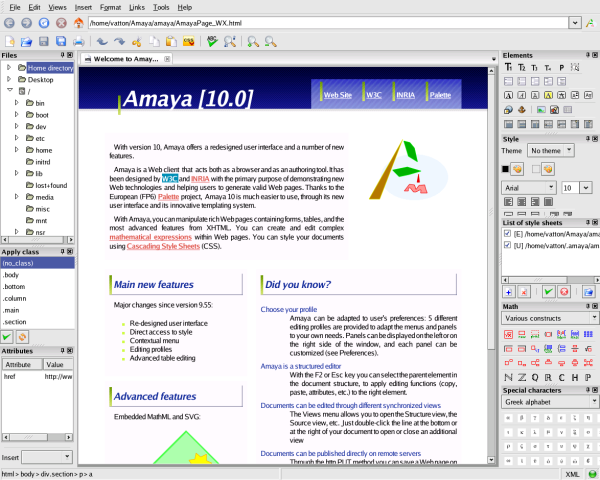 After installing Amaya, I find it yet far from stable but somehow it seems to have a better features than other applications, if you consider that other software are simple Text Editors and Amaya is like a WYSIWYG editor. I tested what you said in your comment and I found that Amaya don't even get noticed that something changed in the files/folders structure/name. Which won't fit your needs related to this. In the next screenshot you can see I renamed the "resources" folder to "resources1" and Amaya is yet showing it as "resources" and there is no way to force it refresh. Even after restarting the software and loading the project again, Amaya won't notice it. I am going to follow your question closely hoping somebody come and drop a good alternative. Kompozer is a decent feature full html/css editor http://kompozer.net/features.php, u can give it a try. Sublime Text has been around for a while. 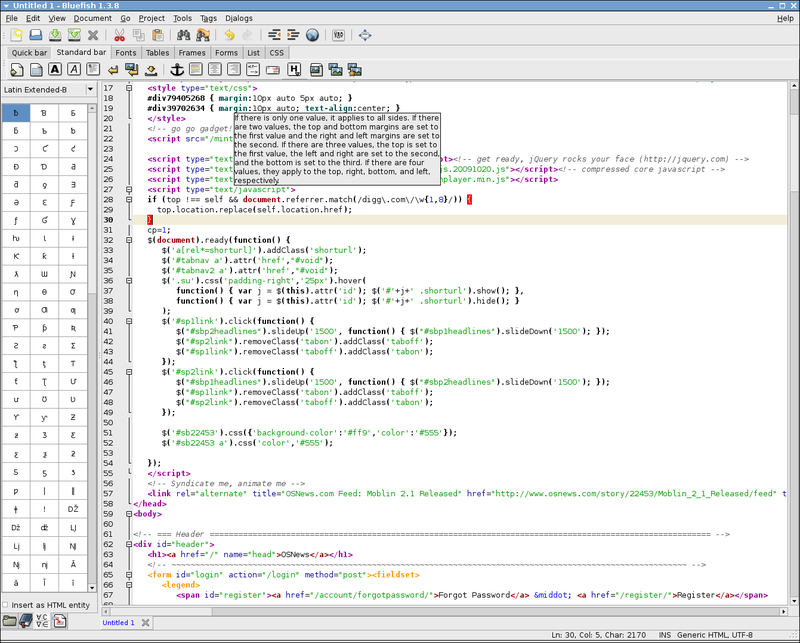 In a nutshell it is a pure text editor that has comparable features to TextMate, but it has a much more fluid modern GUI and is incredibly extensible which can enhance it past just a text editor. Sublime has an ever-growing package ecosystem, that uses Python to script the editor, making it possible to transform Sublime into a full-featured IDE rather than just a standard text editor. 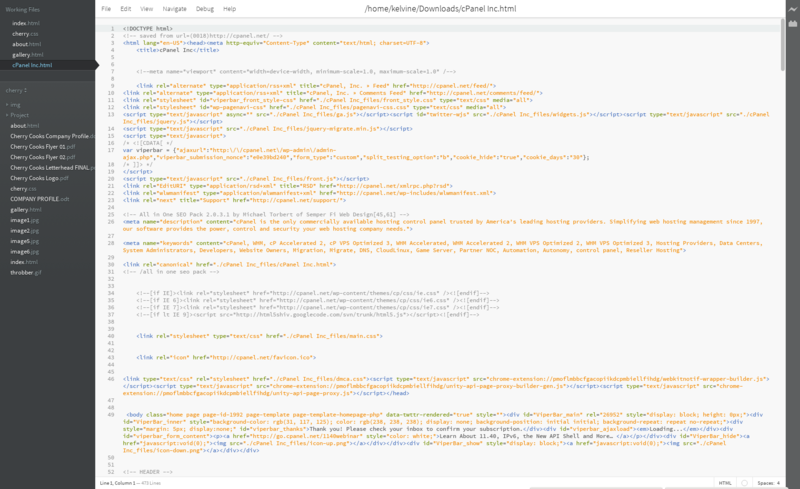 The beauty behind the way Sublime does this is that you start off with a simple text editor and only add what you need, rather than the approach of other IDEs where you start off with everything and it is really slow and confusing to learn. You've also got the package control package to download and install packages automatically from within Sublime Text itself. Making it really simple to get at ANY feature or file with lazy searches. If you want to open a file in the project with a path of PageView/RT/Login/_Common.php you can just type pvlcom into the goto anything window. Changing the syntax highlighting or interacting with a package is also possible through the command palette. I use Sublime Text 3 for web development, and the package community has something for every need... I'm sure there are packages for other environments too. Here's just a breakdown of what ST3 offers me, a web developer. Syntax highlighting for Behat / Mink. PHPUnit package to allow class's tests to be run from the class itself. PHP XDebug to step through your code and inspect variables at execution time. PHP parsing. Displays errors inline in your code when there is a syntax error. There are also many MySQL capabilities of ST3, but I have other dedicated software for that so haven't looked into it. Blue Griffon is standalone editor similar to Kompozer (both come from Nvu), but it's under active development - it supports HTML5 and CSS3. Web Developer addon for Firefox offers some support for live editing of CSS and HTML with saving, however it's not very robust (no syntax highlighting etc.). For your Firebug question, see Stack Overflow. Note that some versions of Dreamweaver can be run using Wine, check out Dremweaver entry at WineHQ. But you can use any other text editors to edit files like Gedit, vim, etc. 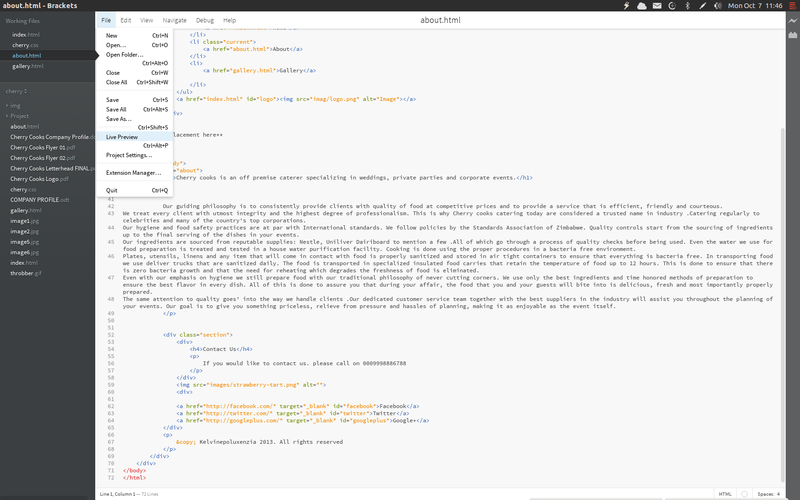 I use BlueFish for my HTML and CSS editing, but it doesn't have a full WYSIWYG editor. Unfortunately, there is no drop in replacement for Dreamweaver on Linux. If you have a license, Dreamweaver is rated Silver on WineHQ, so you may have luck installing it with Wine, though I cannot guarantee it, and you might experience issues with the installation. You can look at the issues listed for Dreamweaver CS5 at WineHQ. As far as FireBug, I usually just copy and paste the edited code into a gedit and put it where I need it from there. I'm sure their's others as well. I've tried a few of the WYSIWIG ones, but I've yet to find one that comes close to Dreamweaver's abilities, although I've run those to their limits at times as well. Supports a lot of different programming languges and HTML. I never use anything more than just Gedit, which does it all fine (I program mostly directly; never WYSIWYG, gives you cleaner code). But as said before, there is also Bluefish Editor which is very good too. After having tried it myself, I only find very minor faults with it. But Kompozer is a very good alternative, if you prefer WYSIWYG editors, although for more advanced programming I do not recommend it. Gedit with plugins is all i need for most of my html needs. 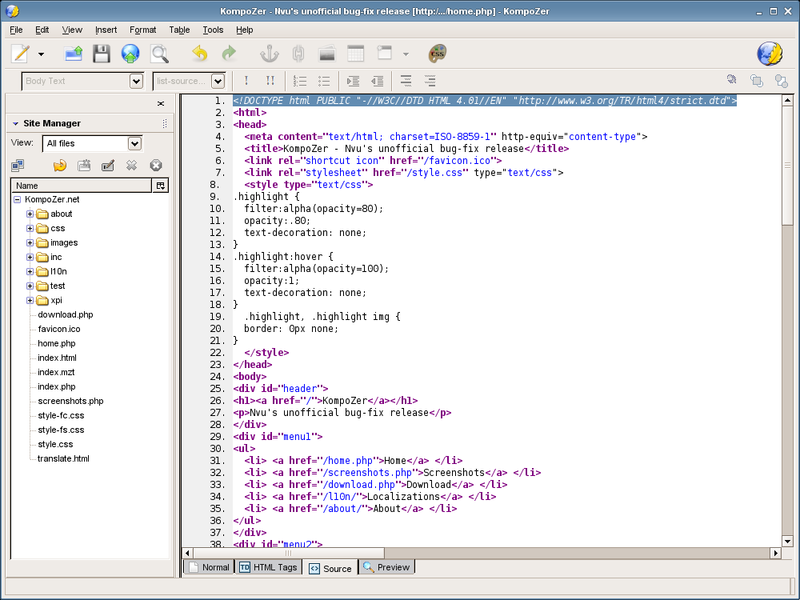 Seamonkey-compozer which is very similar to kompozer is a cool WYSIWYG editor. 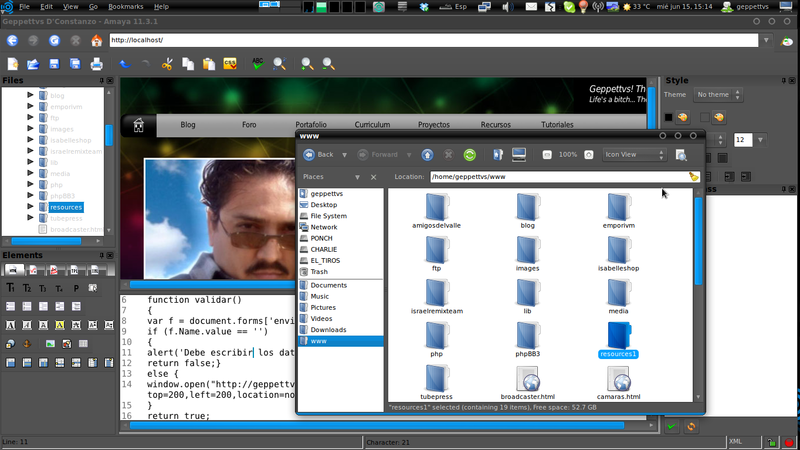 It has no kde dependencies and is actively developed. For PHP and the likes I love bluefish because it has got Code and syntax highlighting. You don't indicate whether you prefer a free product, so may I suggest PhpStorm or WebStorm, both from JetBrains. They are payware, but are not terribly expensive. The site says they are cross-platform; I haven't tried them on Linux, but they work quite nicely on Windows. They are complete standalone IDEs: the former specializes in PHP development, while the latter is a bit broader for general web development. There are free trials available, so why not given them a go? ** No affiliation, just a satisfied customer! Out ther are much competition ! Sorry for what i must tell , i'm a linux enthousiast but linux software won't get you far. Kompozer and bluegriffon are nice but they will make your life harder and you won't get a professional result so you will not go far ! Sorry ! i dont like what i'm gonna say but windows is the only solution if you are professional. I'm not a fan of dualbooting so i formatted my pc with windows no matter how i hate them. Operating system's purpose is to have available software to make your job done and not countless distributions. If you want a simple webpage you can download for free bluegriffon and buy the templates addon you will find it very usefull !! Also there are countless free templates online that you could use on kompozer to build your webpage faster. PS1: i may change my mind when ubuntu 12.04 will come cause i'm really a fan of ubuntu. 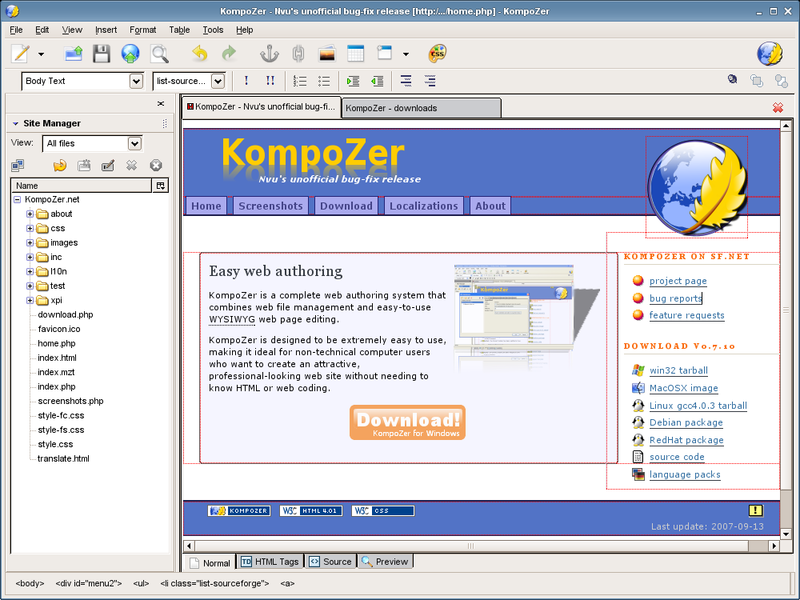 I have personally used KompoZer for web development since few years. I also designed the new official website for KompoZer using KompoZer itself. However, KompoZer has not been updated since some years. So I have been trying BlueGriffon for a while. 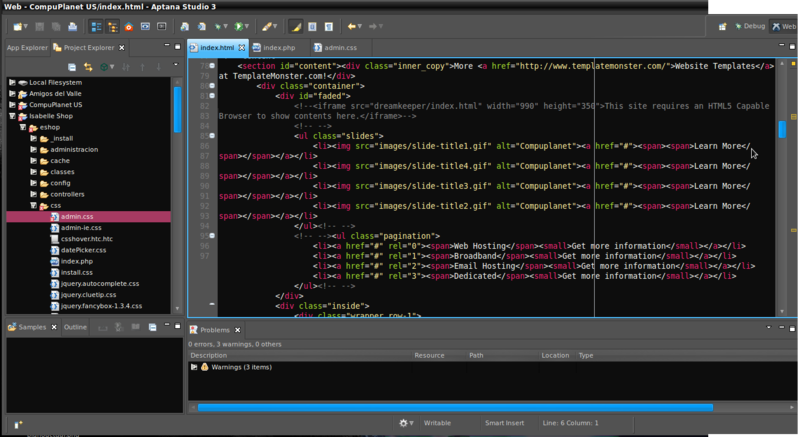 It does take some time to get used to BlueGriffon but it is the closest thing you can get to Dreamweaver. 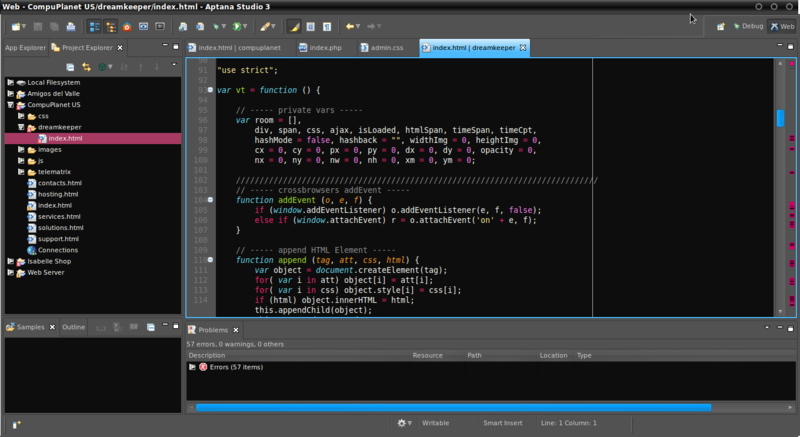 Also, for scripting purposes I use Aptana Studio or Eclipse. I spend many time to find replacement, but true is Quanta, KompoZer and others great horror against Dreamweaver. So ur can did it my way, use Wine for DW and +Firebug+GoogleDeveloperTools. I'd suggest Aptana Studio 3 or Titanium Studio. Both are from Appcelator. More over, with Titanium Studio, you are able to create native applications for windows, linux, mac, android and ios. Not the answer you're looking for? Browse other questions tagged software-recommendation development ide web-development web-design or ask your own question. What IDEs are available for Ubuntu? For a newbie, what software/ IDE is best to build a website? Is there any App like DreamWeaver in Ubuntu? What's Ubuntu's app development IDE?